I was walking the dog past a neighboring garden when I noticed movement out of the corner of my eye. 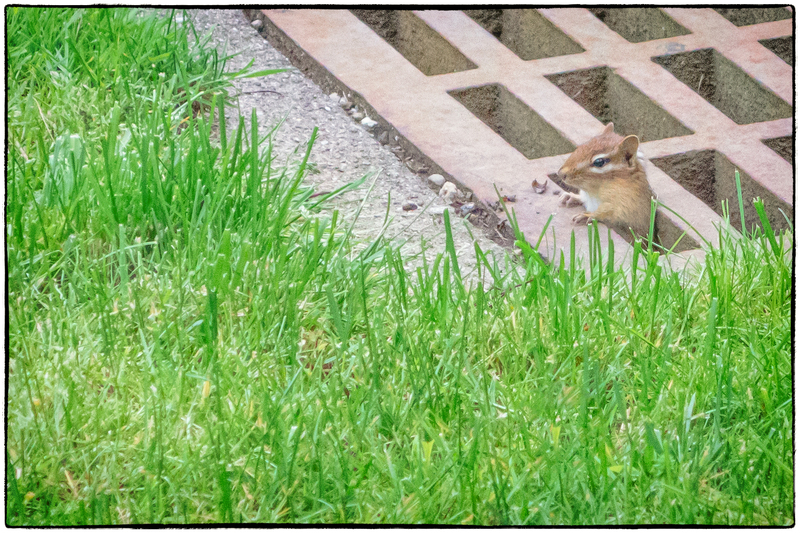 Inside the garden was a grid and from time to time a small head would pop out: a chipmunk. Up it would pop. Then it would get nervous and disappear for a while. It repeated this process for quite some time. Regrettably the only camera I had with me was my iphone and I couldn’t get anywhere near enough to take a decent picture. Nonetheless I snapped away and came up with something, which (after very severe cropping) I felt I could share with my wife and grandkids. A few days later I passed by this garden again and sure enough there was the chipmunk going through the same routine as before. This time I was better prepared and had a more sophisticated camera with me. Patience has its rewards. Not a great picture, but kinda cute.